Solid-phase extraction (SPE) is a sample preparation methodology that involves separating compounds from within solid samples by suspending them in a liquid mixture and promoting agitation. This process allows researchers to isolate desirable analytes from the broader sample matrix. Various application specific SPE methods exist, but the QuEChERS method is the preferred laboratory mixing technique for maximum extraction yields of environmental contaminants from organic samples. Laboratory products that operate on the QuEChERS method are designed to be quick, easy, cheap, effective, rugged, and safe. What is the QuEChERS Method? The QuEChERS method of laboratory mixing involves agitating a sample through vigorous mechanical shaking. When the resultant sample is a homogenous consistency, compounds can be partitioned by suspending samples in a specialized solvent or preparation reagent and subjecting them to centrifugal separation. Once an analyte has been effectively separated, it can be analyzed using mass spectrometry equipment. What is the QuEChERS Method Used For? Laboratory mixing instruments that operate on the QuEChERS method are accepted for the precise assessment of agrochemical residuals in consumable organic products. The prevalence and comprehensive dispersion of pesticides through sensitive ecological systems remains an intensive area of research. Analysts use multiple evaluation methods to determine the volume and concentration of agrochemicals in the human food chain. It is possible to assess the concentration of pesticides and environmental contaminants in animal proteins for example, by homogenizing biological samples with solvents through pre-defined mechanical pulses or sustained agitation. Rugged laboratory mixing instruments for the first stage of the QuEChERS method included vortexers, vibration shakers, and probe blenders. 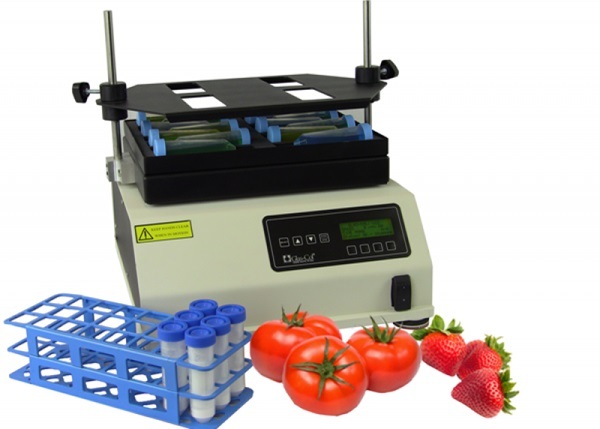 Limited mixing periods with this equipment can provide accurate volumetric insights into the presence of pesticides, agrochemicals, and other contaminants in raw food goods. Vortex shakers are capable of achieving excellent degrees of contaminant extraction from homogenized tissues of fish such as croaker and salmon in just 10 minutes, while vibration laboratory mixing instrumentation could achieve 100% extraction in extended mixing times of up to an hour. This methodology has been used to ascertain levels of concentrated pesticides and agrochemicals in the food chain, enabling environmental researchers to accurately characterize agrochemical migration and dispersion properties. At Glas-Col, we are committed to supplying a robust range of laboratory instrumentation for broad range of research and development applications. Our custom mixers have been routinely applied for environmental research applications using the QuEChERS method of laboratory mixing. Our Digital Pulse Mixer (DPM) is a precision instrument with a robust orbiting speed up to 1500 rpm. It is equipped to perform QuEChERS laboratory mixing with capacity of 50 samples and displaying metrics relating to: speed, pulse rate, duty cycle and time. Our LC series has the same capacity as the DPM only with less features. If you would like any more information about laboratory mixing products that are QuEChERS-enabled, please do not hesitate to contact us.